. "Silk Train". The Canadian Encyclopedia, 07 March 2014, Historica Canada. 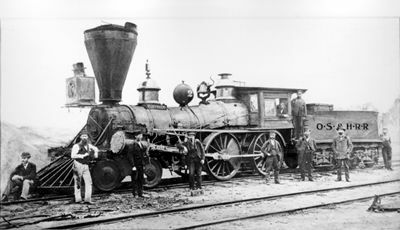 https://www.thecanadianencyclopedia.ca/en/article/silk-train. Accessed 25 April 2019. Silk Train, the term used to describe CPR cargo trains carrying expensive shipments of Oriental raw silk. The trains sped from Vancouver to merchants in eastern Canada and the US, from 1900 to the 1930s. Silk Train, the term used to describe CPR cargo trains carrying expensive shipments of Oriental raw silk. The trains sped from Vancouver to merchants in eastern Canada and the US, from 1900 to the 1930s. The valuable cargo deteriorates rapidly and the market fluctuated daily, so speed, security and safety were essential. Silk arriving by CP ship in Vancouver was loaded into airtight train cars specially lined with varnished wood, sheathed in paper and sealed so that no damaging moisture or thieves could intrude. Armed guards were the only passengers. Trains of up to 15 cars rushed from Vancouver to Ft William [Thunder Bay] in 15 hours less than the fastest passenger train. The silk trains had preference over any others on the tracks: once a train carrying Prince Albert, later King George VI, was held on a siding while a silk train went through. The trains were discontinued in the 1930s with the advent of air transportation and man-made fibres.